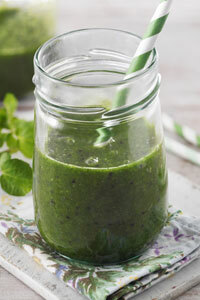 Perk up your diet with a super green watercress smoothie. High in Vitamin C, this watercress and kiwi juice is great at keeping your immune system in check. 1. Place everything in a blender and whizz together. Or if you have a juicer, process the watercress, kiwi and mint together, then stir in the orange juice and lime. Pour into glasses and chill until ready to serve.